If you have created a PowerPoint presentation that is under 20 Megabytes in size, you can upload it directly into Synergy Room using the steps below. If your PowerPoint is above 20 Megabytes in size, or if you are behind a Firewall which prevents you from uploading it using Synergy Room, please refer to our Uploading PowerPoints via FTP guide. 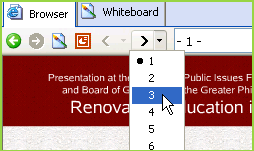 To upload your Power Point Presentation, click the PowerPoint button on your embedded browser or whiteboard toolbar. If the PowerPoint button is not visible on the browser toolbar, then log in as a moderator to enable it. 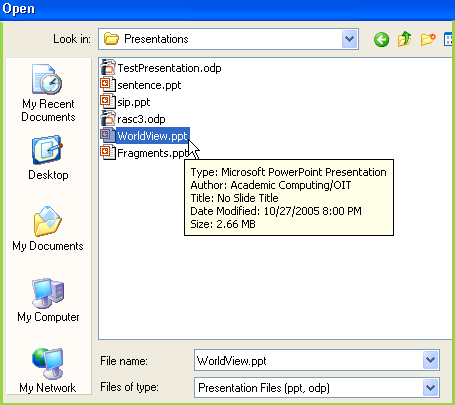 When the Open dialog appears, select your PowerPoint (PPT) or OpenDocument (ODP) Presentation file. Synergy Room will upload your presentation to the server. If the presentation has not been modified since the last time it was uploaded, it may be in the server's cache, and the upload completes immediately. If Synergy Room detects that the presentation is new or has been modified, a fresh copy will be uploaded. When the upload and conversion have completed, the first slide will appear. 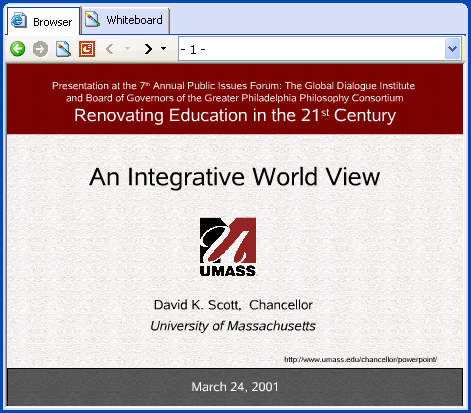 Presentations are automatically available both in the embedded browser (as Flash) and in the whiteboard (as images). Flash slides scale to fill the available space in the Synergy Room embedded browser, and are accessible to assistive technologies such as screen readers. To show flash slides from the embedded browser, turn on the synchronized browsing feature by pressing F3. To show slides in the whiteboard only, it is not necessary to enable sync-browsing. Note the Next and Previous slide buttons on the embedded browser's toolbar. Click Next, or click directly on the slide to bring up the next slide. Expect a short download delay the first time each slide is shown. 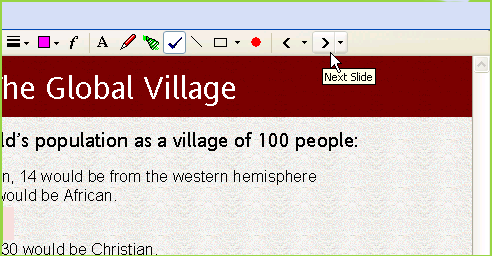 Clicking the slide dropdown shows the current slide number and allows the presenter to jump directly to any slide in the presentation. Clicking on the Annotation button opens the current slide in the whiteboard. In the whiteboard, the slide can be interactively annotated in a shared environment. For keyboard navigation to function in the whiteboard, give the input focus to the whiteboard component by clicking on the canvas.